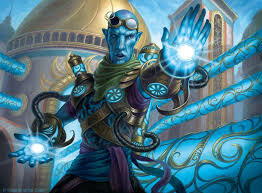 The Vedalken of Ravnica are a race of intelligent, blue-skinned humanoids driven relentlessly towards perfection and improvement. Find out what it means to play one in Dungeons and Dragons. The Vedalken are almost elven, from a distance, but up close they tend to skew a little more Vulcan. Let’s look at what drives these intensely curious, rational-yet-emotional creatures. 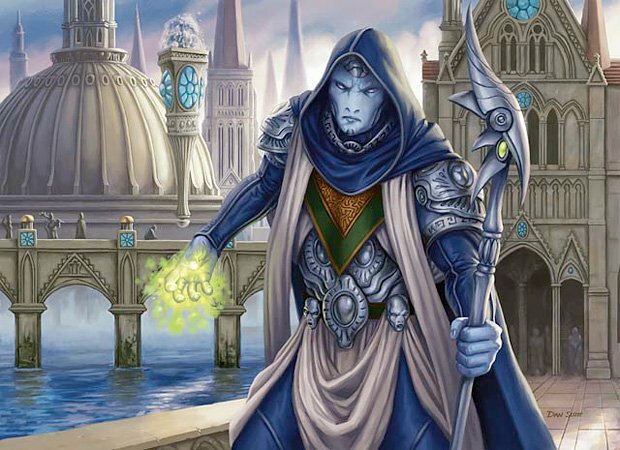 So, as mentioned before the Vedalken are blue, and like many things in Magic the Gathering, they are conveniently color-coded. Most Vedalken are associated with Blue Mana, blue being the color of control magic, weird experimentations, invention, and Eiffel 65’s house. This suits them, as they are an intelligence-driven race, who are eager to see how they can improve the world around them. They believe every setback is an opportunity to improve the world around them, they have a reputation for being coldly rational. However, up close this doesn’t hold true–they feel emotion but aren’t as skilled at displaying them. They are driven by a desire to control things, though, which can lead them to approach things with a rational curiosity. This is all represented by their built-in traits. As you might expect, they get their stat bumps to Intelligence and Wisdom, a +2 and +1 respectively. Aside from the usual fluff–they live longer than human, have medium speed, that sort of thing–they have precious few traits. But the ones they do have are astoundingly good. Vedalken Dispassion is perhaps the strongest trait, giving you advantage on all Intelligence, Wisdom, and Charisma saving throws. This is incredibly powerful, making Vedalken incredibly resilient. They’re like Elves but better, giving them advantage on more than just Charm spells. It gives them resistance to some of the more powerful “encounter ending spells” and will pretty much help ensure that you’re always in control of your own character. With their Tireless Precision you get proficiency in a skill of your choice from Arcana, History, Investigation, Medicine, Performance, or Sleight of Hand, and proficiency with a tool of your choice–and with those skills you get to add an extra d4 to your roll–which is very interesting because at low levels, it’s basically Expertise+ half the time, AND it stacks with Expertise. A Vedalken Rogue or Bard, while unorthodox, could dominate the Investigation or Sleight of Hand department. And that’s all they get. But again, what they lack in quantity, they make up for in quality. 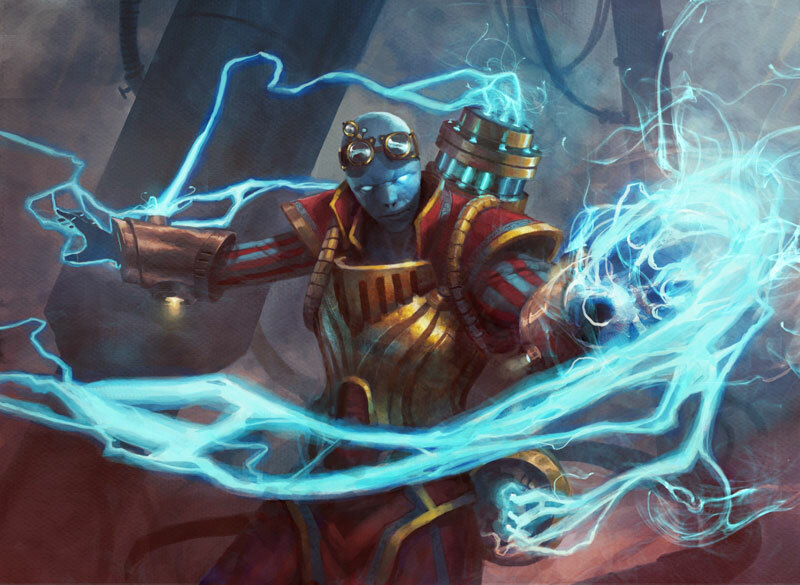 Vedalken are natural Wizards, one of the few to have a +2 Intelligence boost–and a buff to Wisdom might be good for those planning to multiclass. Again, given their proficiencies, they’d probably make excellent Investigative or Mastermind Rogues, though you’d be fighting your Dexterity early on, but as we’ve recently learned, things like accuracy and armor class matter very little in terms of actual combat effectiveness, so starting out without a 16 Dex is not too bad, especially with the Inquisitive’s means of getting advantage and extra damage. 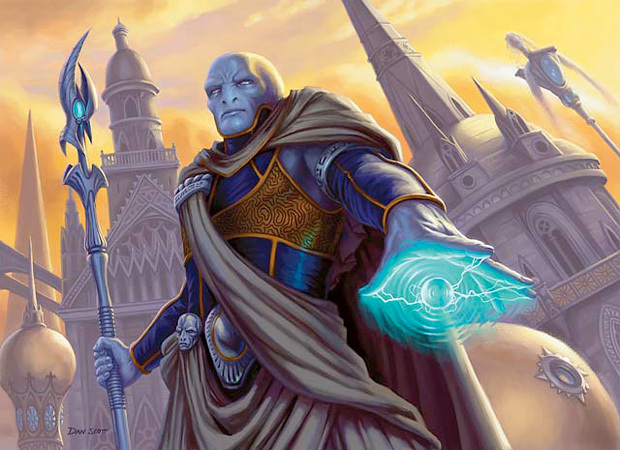 I’m curious to see what else comes out in the Guildmaster’s Guide to Ravnica, it seems like there could be some extra subclasses for the Vedalken to lean into. But time alone will tell. In the meantime, as always, Happy Adventuring!